"Planned highway work to transform southeast Pasco." Tampa Bay Times (FL), November 29, 2013. 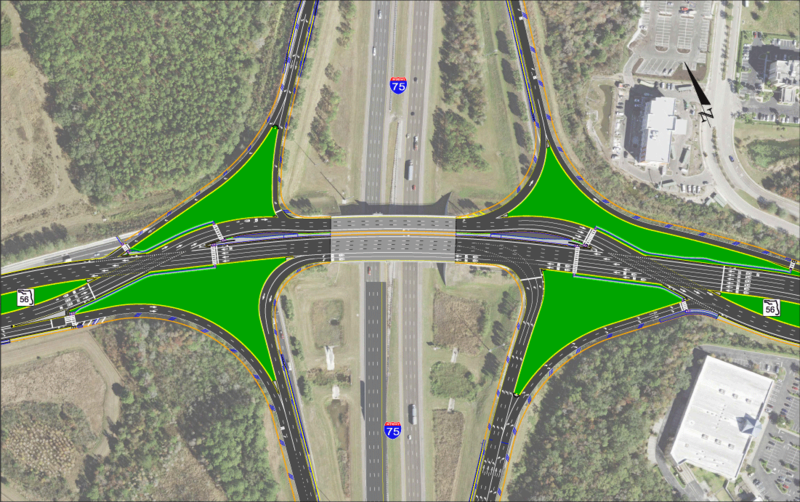 "New diverging diamond interchange at I-75, State Road 56 intersection to ease traffic." WFTS (Tampa, FL), March 14, 2018. State Road 54 Project Development & Environment (PD&E) Study FDOT District 7 - archived studies. Interstate 75 at State Road 56 (new interchange & new road construction) - 258734. http://mytbi.com:80/content/users/projectinfo.asp?projectID=60&RoadID=4 Tampa Bay Interstates (FDOT District 7 project web site).